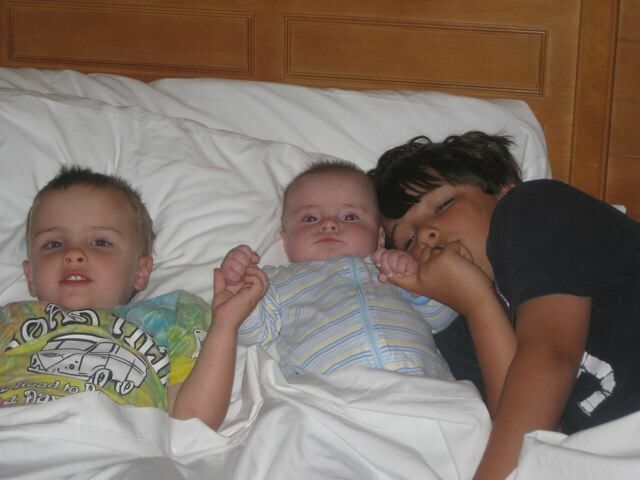 I’m a dad to three boys… called me blessed or call me crazy. Actually it is mostly both at the same time. We don’t really hype holidays or special occasions all that much in our home, so this post isn’t too linked to Father’s day, but it did get me thinking on the subject. And since I’ve been re-reading Wild at Heart, everything came together in thought one night and now I’m just getting around to putting it down. To be honest, I’m a little amazed at this whole concept of fatherhood. To think that I have direct responsibility (or better privilege) in shaping the hearts and lives of my boys is at times overwhelming. I’ve thought back quite a bit on my own father (and Happy Father’s Day and birthday, Dad) and the relationship we have now and what it was like growing up. It’s kinda funny how it took becoming a father to realize how much I was shaped and influenced by my father. Needless to say, some of the shaping came in the form of a thick leather belt traveling at the speed of sound towards my backside. I realized this Father’s Day that Brock has already crossed the halfway point in his time in our household. Man, the time has flown by. Jake’s in the middle and appropriately usually in the middle of trouble. But he is in the “I love Daddy” stage. I’ll remind him of this stage when he becomes a teenager. Bringing up the rear is my newborn, Cole, who just looks at me and smiles… until Brooke goes to work and then he cries… and cries some more. Such innocence is amazing, though. What a gift God has given me in these three. Thankfully the whole understanding of my spiritual Father overshadows my fears, insecurities and inadequacies of being a father to my boys. As if the promise in 1 John 3, “How great is the love the Father has lavished on us, that we should be called sons of God…” isn’t amazing enough. Proverbs 14:26 says, “He who fears the Lord has a secure fortress, and for his children it will be a refuge.” It is so comforting to know that I’m not in this alone. I run in pursuit of God so that my boys can be challenged by the potential of likewise knowing, loving and serving God. I can only pray that my boys will come to the realization of Christ’s presence in their lives so they may discern that being a Christ-follower is infinitely more about a heart relationship with Jesus than simply trying to live a meager existence of Christian duty. I desire that they would give their lives away for the sake of the Gospel. I hope that the things of the world would pale in comparison to the joy of being found in Christ. I pray they understand their lives will be measured by how well they love. I want them to know that God desires our best, deserves our best and will ultimately demand our best. I pray they would know that following Christ isn’t something that can remotely be done halfheartedly, but that it is central to all that they do and all that they are. I want them to know that the greatest fear in life shouldn’t be failure, but of succeeding in life in things that don’t matter for the Kingdom.